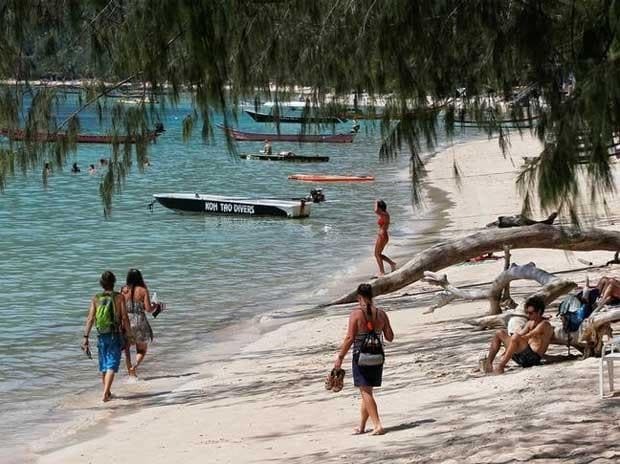 Tens of thousands of tourists have fled the Thai resort islands of Koh Phangan and Koh Tao in a mass exodus ahead of Tropical Storm Pabuk which is set to bring heavy rains, wind and seven metre (22 foot) waves, officials said Thursday. The islands, hugely popular with tourists especially during the peak Christmas and New Year season, have emptied out since Wednesday as tourists packed onto ferries bound for the southern Thai mainland, with swimming banned and boats set to suspend services. Pabuk, Thailand's first tropical storm in the area outside of the monsoon season for around 30 years, is poised to batter Koh Phangnan and Koh Tao as well as Koh Samui on Friday night, before cutting into the mainland. "I think the islands are almost empty ... between 30,000 to 50,000 have left since the New Year's Eve countdown parties," Krikkrai Songthanee, Koh Phangnan district chief, told AFP. Pabuk was packing winds of 104 kilometres per hour(65 mph) but was unlikely to intensify into a full blown typhoon, according to forecasters. "It's difficult to predict the severity of the storm so people should comply with authorities' recommendations." On Koh Samui, the closest of the trio of islands, authorities said they were preparing shelters for any tourists who decide to wait out the storm.